With my calligraphy pen I write the name of the tiny beloved baby boy, on the inside of a Comfort Angel, and hand it to his father, for safekeeping. After a moment of silence and a prayer for healing broken hearts, I sing Amazing Grace for his Christian family who now grieve his passing. Down the hall, an environmental services worker catches my hands and asks me to pray for her grown son who is suffering from a mental illness. Whispering, we chant “To God the Glory!” a few times in Punjabi.. She is Sikh. I have already given her the Wahe-Guru prayer card, which she carries in her work apron. The familiar homeless patient comes to the emergency department again, fully intoxicated and seeking a sandwich. For him I fold the Imagine Healing care card and spend a few minutes listening to his woeful stories. He doesn’t believe in God, but bursts into tears as I hold his hands and speak words of caring and kindness. In the ICU, a nurse asks me to sing to a Jewish patient with dementia because her son can’t visit today. I sing Mi Sheiberach and leave the Merkabah card at her bedside. The day ends with singing Ave Maria for a dying Mexican grandmother who is already seeing her own mother in the foggy world of In-Between. To her, I give the Virgen de Guadalupe card and to her daughter, the brown-skinned Heal Me, Jesus card. Both of them kiss the images and cross themselves before thanking me profusely in Spanish. For each patient, I adjust my lens to see their unique needs and do my best to meet them where they are through presence, prayer, ritual, and art. As an interfaith minister and chaplain, this is my joy, my heart, and my calling. Approaching my ministry from a pluralistic perspective where all paths to the Divine are equally valid, I have opened myself to experiencing and internalizing the unique beauty each world religion has to offer. And thus I have created a ministry of art to give back to all people: Religious, Spiritual, Human. 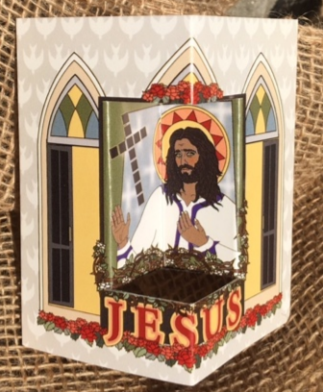 Each month, throughout my year of immersion in interfaith studies intensives offered at The Chaplaincy Institute, students were assigned an art project. At the end of twelve modules, I had a large and varied collection of digital pieces created in Adobe Illustrator, inspired by my study of world religions. They were personal pieces, illustrating my own interpretation of holy images, which became a kaleidoscopic documentation of my interfaith learning. I had no idea they would become the foundation for a new kind of ministry. Just as my year of interfaith studies came to an end, I leapt into a two-year extended Clinical Pastoral Education(CPE) program as a chaplain intern for Kaiser Permanente hospital in San Leandro. The spiritual care office there had cupboards filled with items chaplains could give to a patient or family in their time of need. There were countless Bibles provided by the Gideons, electronic recordings of verses from the Qu’ran, nylon prayer rugs in a drawstring bag, plastic rosaries, wooden prayer beads, and a handful of donated quilts. And, there were prayer cards. Being an illustrator, these caught my interest, so I took time to study them. To my surprise, all of the prayer cards were Catholic. Pictured on one side was Mary, Jesus, or the Holy Family, and the other side had familiar, comforting prayers. The Catholic patients to whom I gave these prayer cards often asked for tape so they could fasten them to the wall as a reminder that they were connected to their faith during their hospital stay. Ideas quickly took root in my head, not only about creating prayer cards for people of all religions but creating them so they could stand on their own on the bedside table, without tape. The first cards I created were angels. They created quite a buzz in the hospital. Patients and staff alike were thrilled to receive them. From there I created a standard design that could incorporate much of the artwork I’d already created. Soon I had developed a nativity scene, and three different shades of Jesus. I wrote most of the prayers myself. Heartfelt words tumbled out of me that touched on the common experiences of vulnerability, of grief, of healing. For faith traditions less familiar to me, I consulted with people who practiced them, enlisting the help of hospital volunteers, employees, their families, and local faith leaders, all who excitedly referred me to images, prayers of healing, and color choices. 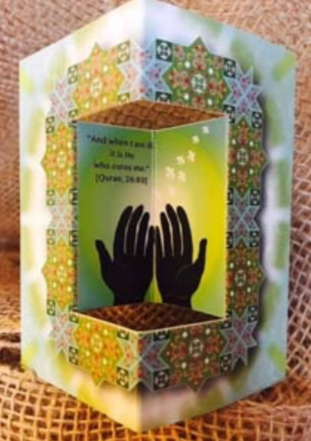 My own interfaith community largely contributed to the creation of what has grown to be a bold, colorful offering of faith-specific prayer cards and secular care cards. What I did not expect was the feeling of empowerment these little cards ignited; not only within myself, but in others who have chosen to use them as part of their work as chaplains. In chaplaincy training, there is a large emphasis placed on being rather than doing. We are warned not to offer things before offering our presence. That said, having a variety of care cards and prayer cards at-the-ready for patient exchanges boosts confidence in our ability to connect with whomever comes to the hospital. Meeting with those who practice a faith less familiar (and for some, less comfortable), the cards provide a starting point to begin a conversation around faith, feelings, and needs. In my experience, using these cards at the beginning of a visit as a tool for connection has facilitated deeper, more intimate conversations and more effective care. For those who are battling chronic illness, grieving the loss of a loved one, or longing for connection to the Divine, the cards provide comfort. For those not facing life-altering transitions, the prayers and illustrations almost always bring a moment of joy and delight. Giving these cards as a gift at the end of a visit affirms and celebrates a patient’s own individual connection to the Divine. For Nurse’s Week, we in the Spiritual Care Department offered a Blessing of the Hands. I created both Self-Care and Bless These Hands cards as gifts for staff. They serve as reminders that balance is key when working in the caregiving profession and taking time out to care for and nurture one’s own mind, body, and spirit is essential. The Self-Care cards have been used in bereavement groups, and many of the cards have made their way into women’s groups, faith groups, and hospice settings. They have been likened to miniature altars. I greatly enjoy the challenge of creatively meeting the needs of our culturally and ethnically diverse community through illustrations and words of comfort and prayer. Each card requires curiosity, research, and connection to become what it is. Each one holds layers of meaning relevant to specific faiths. I have been blessed with an overwhelmingly positive response to my artful approach to interfaith chaplaincy and am excited to share this work with the world!